In 2007, H.E.S.S. reported the detection of very high energy gamma rays from the direction of the young stellar cluster Westerlund 2 (Aharonian et al. 2007, SOM 2006/12). While the origin of the radiation - slightly displaced from the cluster center - was not clearly identified, acceleration of cosmic rays in collective winds of the massive stars in Westerlund 2 (top image) seemed a plausible mechanism. One difficulty in the interpretation of results was the uncertain distance to the cluster, with values between 2 and 8 kpc. 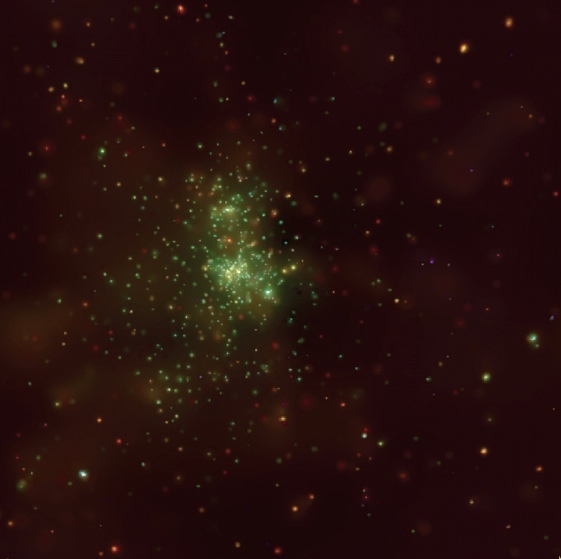 Using CO radio emission and 21 cm absorption, Dame (2007) argued that the cluster is associated with a giant molecular cloud of about a million solar masses, at a distance of about 6 kpc. The cloud would provide an obvious target for gamma-ray production by cosmic rays accelerated in the cluster. Higher-resolution CO measurements with the NANTEN2 radio telescope revealed two clouds with significant velocity dispersion, confirming the distance estimate but causing Furukawa et al. (2009) to argue that star formation in Westerlund 2 was triggered by a collision between the two clouds (see also Ohama et al. 2010). While these clouds move at velocities between -10 and +20 km/s relative to us, a rather peculiar configuration of molecular clouds was detected in the same direction, but at velocities between 25 and 30 km/s (Fukui et al. 2009): a molecular arc or partial shell located on one side of the H.E.S.S. gamma-ray source, and a 'jet' of molecular material emerging on the other side (Fig. 1). Fukui et al. speculated that the gamma-ray emission and the jet might be related to a common energetic event, with a jet of high-energy particles triggering the condensation of molecular material along the jet. X-ray observations of the cluster showed thermal emission from a large number of hot young stars (top image), but no indication of synchrotron emission from high-energy electrons (Naze et al. 2008). However, the Fermi Gamma Ray Space Telescope in 2009 discovered a possible counterpart of the H.E.S.S. source (Dormody 2009): the ~4600 year old radio-quiet pulsar PSR J1022-5746 located well within the extended H.E.S.S. source (Fig. 1), featuring a very high spin-down energy loss of ~10^37 ergs/s, ample to power an extended nebula of relativistic electrons giving rise to the very high energy gamma rays, as opposed to the pulsed emission detected by Fermi and emitted in the direct vicinity of the pulsar. A second pulsar - PSR J1028-5819 - was detected by Fermi about half a degree away from the H.E.S.S. source (Abdo et al. 2009), with a still very substantial spin-down energy loss of ~10^36 ergs/s. In parallel with these developments, continuing H.E.S.S. observations more than tripled the original data set of about 14 h. In the larger data set, a second source - HESS J1026-582 - emerged about 0.6 degr. from the original source HESS J1023-575 (Fig. 2); the new source was particularly evident at higher energies (Fig. 3 left), due to its hard spectrum (E. de Ona Wilhelmi, ICRC 2009). While roughly located in the direction of the CO 'jet' visible in Fig. 1, the source does not really coincide with the 'jet' clouds. It could, however, be explained as a slightly offset pulsar wind nebula created by PSR J1028-5819. The new data confirm the original results on HESS J1023-575, which is now detected with a significance of 16 standard deviations. From the H.E.S.S. data alone, it is impossible to distiguish between an origin from the pulsar PSR J1022-5746 (see Fig. 3 right) or from stellar winds, but given the abundance of gamma-ray emitting pulsar wind nebulae in the Galaxy, Occam's Razor certainly favors the first explanation. Reference: H.E.S.S. Collaboration, to be submitted to A&A; see also E. de Ona Wilhelmi et al., "Revisiting Westerlund 2 with the H.E.S.S. telescope array", Presentation at ICRC 2009, Lodz. Fig. 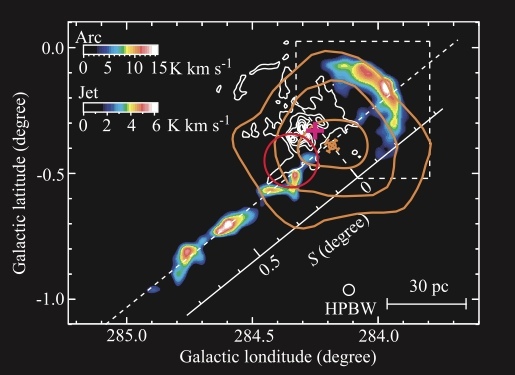 1: The arc-and-jet structure seen in molecular clouds in the velocity range between 25 and 30 km/s (Fukui et al. 2009). The orange contours indicate the H.E.S.S. 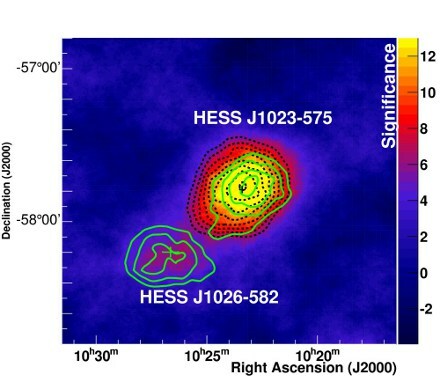 gamma ray source HESS J1023-575, the red circle the Fermi source PSR J1022-5746. The red cross shows the center of the Westerlund 2 cluster. Fig. 2: H.E.S.S significance sky map of the Westerlund 2 region. Colors give overall significance, using a 0.22 degr. integration region around each point. The contours in black and green show the significance contours of maps for low (green) and high (black) energies, starting at 5 sigma in steps of 1 sigma. Fig. 3: Gaussian-smoothed H.E.S.S. high-energy (gamma rays above 2.5 TeV) and low-energy (0.7 to 2.5 TeV) count maps of the Westerlund 2 region.